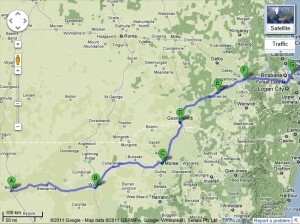 Day 3 will still be a big day of driving with a distance of 941km. We’re expecting quite different landscape on this day as we’re heading up into the mountains towards Toowoomba. We’re planning to head off straight after breakfast from the Motel in Bourke. We head east on the Bourke-Brewarrina Road for about 95km to Brewarrina where we’ll have a quick break to stretch the legs. Might even have a quick coffee at the Muddy Waters Coffee Shop on Bathurst St if we’ve got time (and they are open). We then continue east on the Brewarrina-Walgett Rd for about 120km to Walgett where if we haven’t stopped for coffee, we’ll do that here plus check the car and take some pictures. Walgett is 231km from Bourke, so we’ll have been driving for a couple of hours already. As we leave Walgett, we head north for a short time on the Castlereagh Hwy and then turn north east on the Gwydir Hwy heading for Moree via Collarenebri, a decent leg at 214km. Moree will probably be our lunch stop. We’ve been told about a nice little roadhouse on the Newell Hwy just the other side of Moree which sounds like the right place to check out. From Moree, we’ll head north, north east on the Newell Hwy for about 125km to Goondiwindi which is just inside Queensland from the New South Wales border. 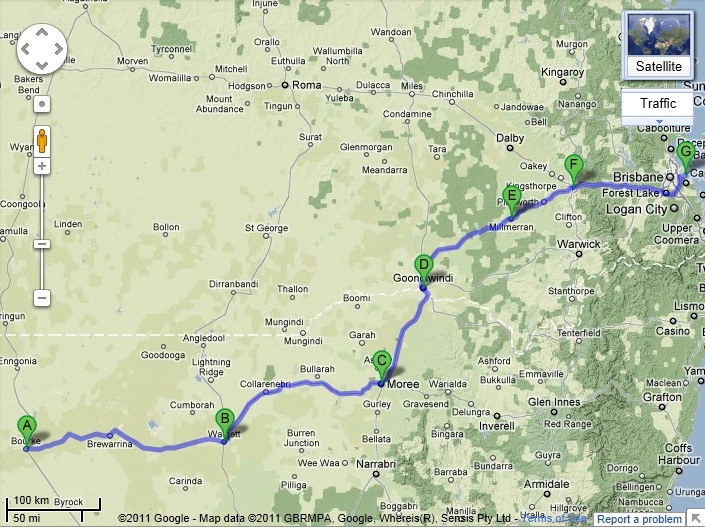 This is where we will need to get fuel considering we’ll have done about 570km since leaving Bourke. Also want to take a few pictures around the MacIntyre River which defines the border between NSW and QLD. After Goondiwindi, we head north east on the Gore Hwy for 141km to Millmerran where we might take a 10 min pit stop and then continue for another 81km on the Gore Hwy to Toowoomba. Hopefully we’ll have daylight still so we can find a lookout for some photo’s considering Toowoomba’s height. We may also stop here for dinner. The last leg of the day is 150km from Toowoomba to Manly with much of it being motorway we should be fine. By the time we get there, we’ll have travelled a total of 2,057km (1,278 miles) in three days so will be looking forward to relaxing with friends. Tagged bathurst st, border, bourke, bourke-brewarrina rd, brewarrina, Castlereagh Hwy, Collarenebri, Goondiwindi, Gore Hwy, Gwydir Hwy, MacIntyre River, Manly, Moree, motorway, muddy waters, new south wales, Newell Hwy, NSW, qld, Queensland, toowoomba, walgett. Bookmark the permalink.